Britt Coulson with one of their recently acquired Blackhawks. The Vice President of Coulson Aviation describes the new Chinook and Blackhawk program they are undertaking with Unical. He also updates us on the firefighting aircraft they have working in Australia during the 2018-2019 bushfire season. It was filmed at the HAI Heli-Expo in Atlanta, March 5, 2019. If you are having trouble viewing the video, you can see it on YouTube. New Los Angeles County FD Firehawks. Photo by LA County FD. March, 2018. At that time it still needed to swap out the landing gear and have the belly tank installed. 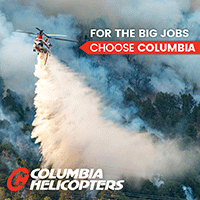 Firehawk helicopters are becoming more popular across the wildland fire services, especially in California. 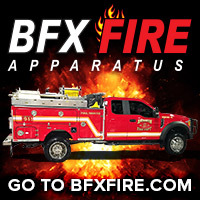 A rather loose definition of a Firehawk is a Blackhawk, a Sikorsky UH-60 or S-70i, usually with an aftermarket 1,000-gallon external water tank for fighting fires, and a suction hose for refilling while hovering. The earliest Firehawk that we are aware of was used in 1998 when Los Angeles County leased one with a belly tank from Sikorsky for about four months. (I’m sure someone will correct me if there’s an earlier occurrence.) Since then many of the newly acquired firefighting helicopters have been, or will be, Firehawks. CAL FIRE has signed contracts and expects to have 12 brand new converted S-70i ships within three years. Their first fully modified aircraft should arrive in June. Other examples of Firehawks include — Los Angeles County’s five (not all are fully modified yet), San Diego Fire Rescue has a one (but it is not yet fully modified), Ventura County has started converting three HH-60L Blackhawks into Firehawks, and Coulson is partnering with Unical to convert about 10 UH-60 Blackhawks. There are also other companies that have various configurations of Blackhawks with tanks. As far as I know most of the above ships will have external water tanks, which require installing a longer landing gear to raise the ship, making room for the belly tank. Coulson, on the other hand, is installing a version of their removable RADS tank internally, and at least one company, Simplex, for example, has built another version of a removable internal tank. The company had it on display last year in Sacramento and at HAI Heli-Expo in Atlanta today. Simplex internal Blackhawk tank.Seen at HAI Heli-Expo in Atlanta, March 5, 2019. Seen at HAI Heli-Expo in Atlanta, March 5, 2019. For the record, Sikorsky, the company that manufactures Blackhawks, does not support the use of an internal water tank in the ships. They are not worried about the floor being able to hold it, but are concerned that in the event of a hard landing the tank, especially when full, could pose a danger to the crew. A belly tank, their theory contends, would not threaten the crew as a projectile, but could crush under the aircraft, absorbing some of the energy — not unlike the crumple zone in the front of a well designed automobile. The engineering design for the water/retardant delivery system on the Coulson-Unical CU-47. Coulson image. Coulson Aviation is expanding their aircraft fleet. Until a few weeks ago the company had four C-130 type fixed wing air tankers, one converted Boeing 737 air tanker (with another that is 60 percent complete), and a mixture of five S-61 and S-76 helicopters. Today Coulson announced a new partnership with Unical Air, a new unit of the Unical Group of Companies. 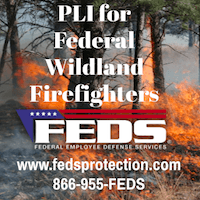 The organizations have joined forces to create a heavy lift helicopter joint venture company that will build and operate Boeing CH-47 and Sikorsky UH-60 Blackhawk aircraft for aerial firefighting and other markets. Coulson’s expertise in the operation of heavy lift and firefighting helicopters will mesh with Unical Air’s abilities in supply chain, and parts, plus aircraft maintenance, repair and overhaul (MRO) and component repair and overhaul (CRO). The capabilities of the helicopters will include night-vision, IFR navigation, and hover filling. The first Coulson-Unical CU-47 lands in a remote area east of Albuquerque February 24, 2019. Coulson photo. At least some of the newly acquired CH-47s and UH-60s will be outfitted with RADS internal tanks. The basic design of the RADS was created by Aero Union decades ago and features steep slopes on the sides when space allows, to facilitate enough head pressure at the bottom to ensure quick and constant flow. 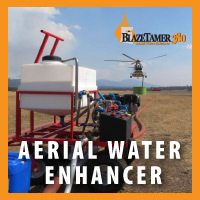 The technology used will enable automated target drops for the night vision goggle firefighting program and will have the capability to adjust flow rates based on speed and altitude. A Coulson helicopter that has been certified in Australia for night drops has been used on a regular basis for the last several months during the country’s 2018-2019 bushfire season. Coulson has engineered several different sizes of the tanks to enable them to be used in a variety of aircraft, including the C-130 and 737. The CU-60 will carry up to 1,000 USG, and the CU-47 will carry up to 3,000 USG. The snorkels used for hover refilling will be a brand new Coulson design, using an electrically-powered pump which will retract into the belly allowing flight to and from the fire with no speed restrictions, along with the ability to taxi around airports or tanker bases. Instead of the water or retardant flowing through a relatively small opening at the cargo hook, Coulson will modify the bellies of both the CH-47 and UH-60. The engineering design for the water/retardant delivery system on the Coulson-Unical CU-60. Coulson image. The helicopters will be type certified and FAA approved, and the models will be renamed. 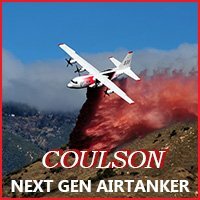 “This partnership with Unical Aviation is the future of aerial firefighting, combining the best of both companies as we introduce the CU-60© and CU-47© Next Gen Helitankers,” stated CEO, Wayne Coulson, Coulson Aviation. The helicopters will receive upgraded cockpits, featuring the Garmin G500H TXi synthetic vision displays and Coulson’s touch screen SMART Delivery System Controller for regulating the delivery of the water or retardant. The concept for the cockpit of the CU-60. Coulson image. Coulson-Unical will have a CU-60 and a CU-47 at the HAI Heli-Expo in Atlanta, Georgia, March 5 to 7. Both have been painted but have not yet received the internal tank modification. The two ships will be available this year with conventional water buckets. By 2020 the company expects to have 10 additional helicopters between the two types.